Secured Business Loans: How to Get the Best Secured Financing for Your Company? There’s a belief that when a business obtains a loan, they must have some sort of collateral to pledge for the lender to be comfortable enough to approve the company for financing. But not all small business lenders have a collateral requirement. In fact, many of the small business lenders offer business loans without collateral. But just because a lender doesn’t require collateral doesn’t mean they don’t want the loan secured. 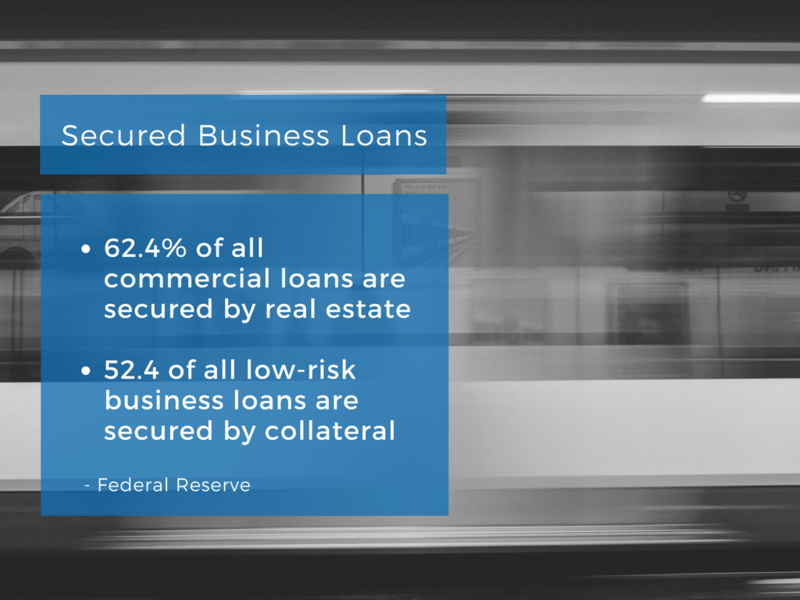 Most lenders that don’t have a collateral pledge will offer loans by securing the financing with the business’s assets, or the business owner’s personal assets. In this article, we will look at “secured business funding” and the options available to small and medium-sized businesses looking for secured working capital options. A secured business loan is any type of commercial debt financing in which the loan is either collateralized with specific and individual business or personal assets, or is backed by all the small business’s assets and/or the business owner’s personal assets. Therefore, there is a lot of overlap between collateralized loans and secured business loans. The main difference between a secured business loan and a collateralized loan is: collateralized loans use very specific assets to secure the business loan, whereas a secured business loan may include not only those specific assets, but a blanket collateralization of all of the business and/or personal assets. Advantages of Secured Business Loans? Higher Approval Rates: Business owners willing to secure their business loan using business or personal assets will find their chances of being approved increased. The reason for the increase in approvals and funding for companies willing to secure financing is because it reduces the lender’s risk exposure. By securing the financing with collateralized assets, the lender will then have a way to recoup their losses if the borrower defaults on their loan. Better Rates and Terms: Once again, it comes down to risk posed to the lender. By reducing the risk that the lender will be able to be “made whole” it will not only increase the chances of getting approved for funding, but will also be reflected in the rates and terms associated with the business loan. Less risk posed to the business lender, the lower the rates and loner the terms associated with the financing. Leverage Assets: Companies that choose to use their business or personal assets to obtain financing may find that they are able to get approved for a much larger amount than they would without pledging the assets. If you have cash-flow that would normally warrant a lower funding amount (because of debt service coverage ratio) they may be able to obtain increased funding by collateralizing the loan by securing it with real estate, machinery or accounts receivables. Disadvantages of Secured Business Loans? Potential Loss of Assets if Default: A definite drawback of securing your small business loan with your company’s assets (or even worse: personal assets) is the loss of such assets should you default on your loan. While it may be appealing to use commercial real estate to secure a business loan, if you find yourself in a tough financial situation, you may put your commercial real estate (or own personal real estate used to secure the loan) at risk of being seized and sold. Lien Placed on Collateral: One the loan is secured by your collateral or a blanket lien on all business assets, you may find yourself locked-out of additional funding. Liens are placed against business and/or personal assets to let other prospective lenders know that another creditor has first rights to claim business or personal assets should a default happen. So when you secure your business loan using such assets, there’s a good chance that a notice will be provided to other lenders to let them know they will not have first right’s to collect – which may effectively lock you out of obtaining additional funds. A personal guarantee is a legal obligation to repay a business loan or else be held personal responsible for the balance. That means that if the business should default on their loan, the lender will then be able to come after the business owner’s personal assets in order to repay the loan. So when a business owner signs a personal guarantee, they must understand that they could very well be putting their home on the line. Does a Personal Guarantee include a Confession of Judgment? A confession of judgment is different that a personal guarantee. While they both relate to the business owner’s personal obligation to repay their business debt using personal assets, a confession of judgment is used to waive the business owner’s rights when it comes to repaying debt associated with the personal guarantee. Commercial Real Estate: using your company’s real estate is probably the best type of collateral for obtaining a secured business loan. Commercial real estate is a desired asset by secured business lenders because real estate is an immovable asset. Since commercial real estate is immovable fixed asset, a lender won’t have to do much work to get control of it during a default. Commercial real estate loans provide borrowers with secured financing up to 90% of the property’s value. Investment Real Estate: While the investment property isn’t necessarily attached to a business operation, it is once again an immovable fixed object that the lender won’t have to hunt-down. Investment real estate comes in different forms, such as secured apartment building loans, secured office building loans, fix and flip real estate projects, and just about any other non-primary residence. Accounts Receivable: Using your company’s AR is a great way to get a secured asset based loan, line of credit, or factoring facility. Secured lines of credit are a very common type of financing for companies with strong AR, who are able to obtain financing based on the company’s receivables. By obtaining a secured factoring line, a company will sell a portion of their accounts receivables to a funding company to access immediate financing. Equipment & Machinery: When it comes to financing business equipment, a common way for a company to obtain the machinery they need is to lease the equipment. By leasing the business equipment, a company can forego paying the full price of the equipment upfront, but can instead obtain the equipment by having a lender secure the equipment for the business, and then the lender will then lease the secured business equipment to the company for a period. Inventory: Another business asset that a secured lender can use to help collateralize your business loan. Inventory isn’t always a preferred asset to use for a secured business loan because inventory isn’t fixed, because it can move at any time. Even more, the inventory can be sold after the loan is provided, leaving the lender with a limited ability to recoup their losses. Therefore, when it comes to inventory loans you’d get much less loan to value than you’d see if you were using real estate to secure business funding. Secured Bank Loans: This is the most common type of secured business financing for a number of reasons. First, secured loans and lines of credit from a bank are the cheapest form of capital a business can obtain. Banks can offer great rates and terms on their loans because the lenders take a reduced risk. A bank lender will require the borrower to have great credit, and will expect the business’s financials to show solid revenues and net profitability. When you collateralize the loan with additional business and/or personal assets, the lender isn’t facing much risk at all. Therefore, a bank lender can offer the lowest cost financing available. Secured Lines of Credit: This type of financing is offered by many different lenders, as secured lines of credit are offered by large and small banks, credit unions, asset based lenders, and other private lending institutions. Most secured lines of credit are collateralized using a business’s accounts receivables or unpaid invoices, and funds may be revolving. SBA Loans: This type of secured business financing involves lending provided by a conventional bank business lender that is backstopped by the United States Small Business Administration. What this means is that the banks provide the secured loan to the borrower, and if the borrower should be unable to fully-repay their loan, the Small Business Administration agrees to cover a majority of the SBA Lender’s losses. The reason this program was created was to help secure financing for small businesses that had good credit and revenue, but were unable to get approved for funding without the SBA enhancement. Hard Money Loans: A hard money loan is a type of financing usually provided by private lenders for short term uses in purchasing or doing a quick refinance of their commercial real estate or commercial property. Hard money loans are usually low doc business loans, and are riskier than traditional business mortgages. With the lender taking on more risk, the loans are generally less than 2 years in term, and have higher-rates than a conventional lender would offer. Commercial Mortgages: this involves obtaining an initial mortgage for your commercial real estate, or refinancing your current conventional or balloon mortgage by obtaining new loan using the secured commercial real estate or commercial property. Secured Asset Based Loans: ABL financing is, itself, a form of secured business lending. Asset based loans are secured by using a company’s business asset equity in exchange for financing. Most common forms of secured asset based loans are real estate, equipment, inventory and accounts receivables. Equipment Financing: Equipment leasing is also a form of secured business financing in that the equipment secures the lease. In fact, since the equipment leasing company is purchasing the equipment and leasing it to the small business, the equipment stays in the lender’s name until the end of the term, when the merchant will then be provided the opportunity to either purchase the equipment outright, extend the term of the lease, or simply return the equipment to the lender. Secured Invoice Factoring: For small businesses and merchants looking for short term working capital and don’t want to take-out a business loan to bridge their financial needs, an option could be to use unpaid invoices to obtain short-term funding. Invoice factoring involves the sale of your unpaid 30-90 invoices to factoring company in order to tap into some of that funding immediately. Secured Merchant Cash Advance: While most merchant cash advance funding companies will advertise their financing product as a form of “unsecured business funding” that isn’t entirely accurate. While merchant cash advances don’t require specific collateral to get approved and funded, they often require a blanket lien to be placed on all of the business assets. Additionally, the use of confessions of judgments have become more commonly used by merchant cash funders – which is used to recover lenders losses by the borrower should they default. Secured Alternative Business Loans: Most alternative lenders (like fintech lenders, marketplace lenders, private & non-bank business lenders) will require their loans be secured by business and even personal assets. With that having been said, alternative business loans rarely require specific collateral be pledged to get funded. How to Get the Best Secured Business Loans? Hundreds of billions of dollars in capital are provided by business lenders each week – the majority of which are secured financing. With so many secured funding options available its important that a company seek out the best options to ensure their cost of capital is as low as possible, and their ability to service their debt is smooth. If you need help with learning about your secured business loan options, and need help navigating the funding process, please reach-out to one of our secured financing specialists, and we’ll help you navigate the process.